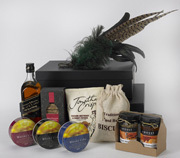 Hold on to your customers and clients and lock in new ones with the power of an Inhouse hamper or gift. Reward your employees with good taste - literally. We will help you set new standards in customer retention, staff retention, and customer care. Inhouse offers the convenience of a personal account manager who will happily discuss your requirements by phone and for large orders will meet with you at your convenience. 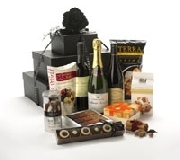 Many of our customers send a considerable number of hampers. We will gladly assist you to choose the most suitable and cost effective way to fill a substantial order. Discounts available for large orders. Created especially for our Christmas Season. 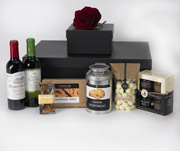 A Luxury gift box with Delicious fruit Cake, Sweets and a bottle of red or white wine. Celebrate in style with this superb collection of festive food, wine and treats to savour in our two-tiered tower of stylish black boxes. Something for everyone, if you can bear to share, with this generous selection of gourmet food and wines. Savour each tantalising delicacy from gourmet confectionary to hand made chocolates complimented by a choice of exceptional wines and champagne. These sweet treats are all nestled together in a sublime tower of black boxes. 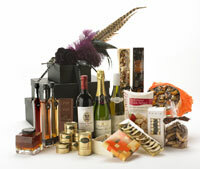 Foodies and wine lovers will revel in receiving this very special collection of sweet and savoury foods and wine. 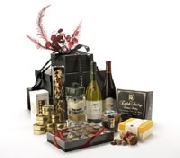 A 3 tiered hamper full of delights topped with designer decorations. Decadent decoration is the starting point for this luxury selection of food, wines and champagne. 3 sleek black boxes teaming with sweet treats and gourmet food. A feast for all the senses, delectable foods, glorious wines, champagne, simply beautiful liqueur, all in eye catching designs to tempt you through the festive season and beyond.